Stray light is one of the most important factors which can influence photometric accuracy and precision. 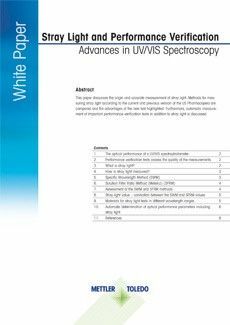 The procedure for stray light testing is currently of high interest and widely discussed, as the US Pharmacopeia introduced a new chapter on ultra-violet visible spectroscopy and adapted the existing test for stray light. The instrumental performance is the main factor directly affecting the accuracy and repeatability of the measure­ments. 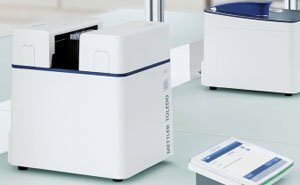 For critical UV/VIS measurements, especially in clinical, pharmaceutical or industrial quality control, it is crucial that the instrument is performing according to specification. In laboratories working according to Pharmacopeia regulations (e.g. USP or Ph. Eur. ), it is important that the instrument performance is monitored regularly and documentary evidence has to be present. 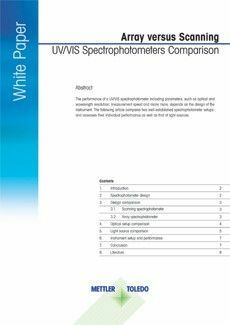 This whitepaper discusses the origin and accurate measurement of stray light. 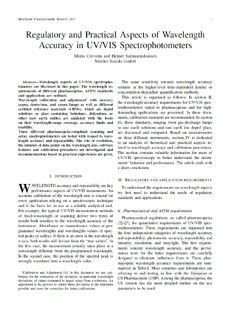 Methods for mea­suring stray light according to the current and previous version of the US Pharmacopeia are compared and the advantages of the new test highlighted. Furthermore, automatic measure­ment of important performance verification tests in addition to stray light is discussed. How is stray light measured?